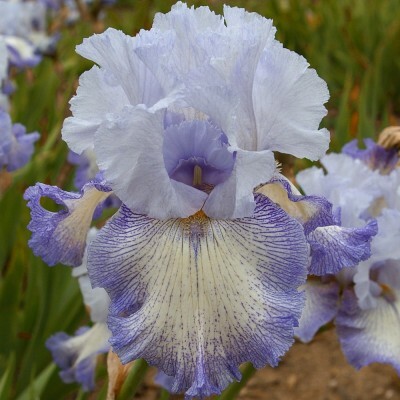 Gracefully shaped flowers with sky blue standards and darker blue-violet plicata markings on ruffled ivory falls. 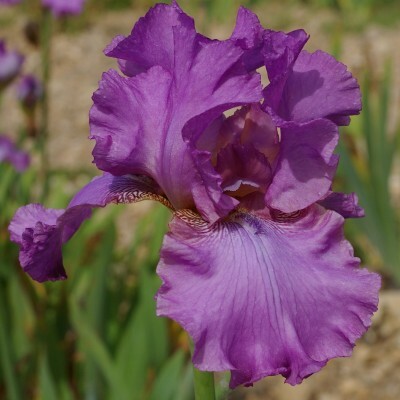 Popular iris, prize-winner several times despite a moderate average count of buds (only 5 to 6). 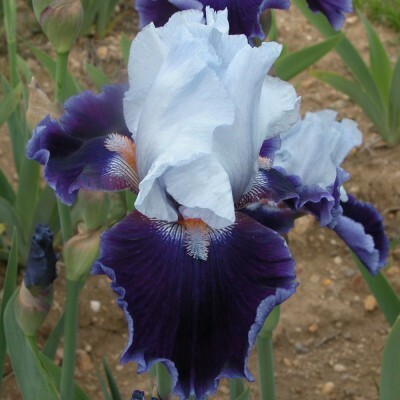 Standards are a light lilac blue, darker at the base; wide, softly bluish white falls. Remarkable bright white beards tipped in coral-red. An exquisite shape with a number of small and tight ruffles. Moreover, a very soft and attractive fragrance. 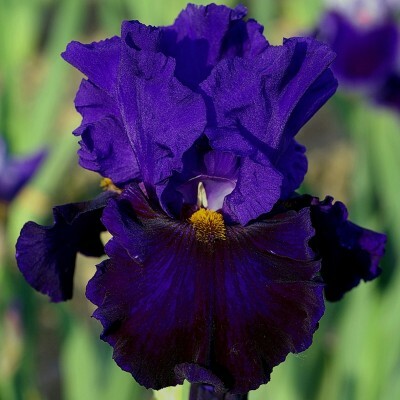 Quite innovative in this range: purplish violet standards with lacy edges, falls slightly bolder with a narrow bronze border, old gold beards set against a small white background which lights up the whole flower. Descendant of "Serene Moment". Interesting and late-flowering. 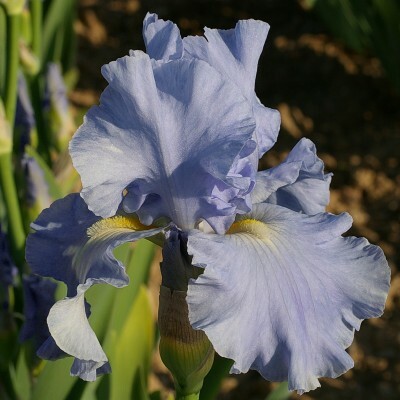 Magnificent very pure sky blue, with small pale yellow beards towards the centre becoming white at their ends. Flowers close to the stem but well spaced and moderately ruffled. Very upright stalks and long-lasting flowers (9 – 10 buds on average). A good grower. 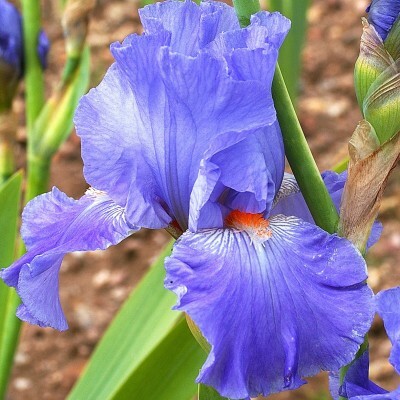 Very graceful small orange iris of strong substance with large, nearly horizontal falls. 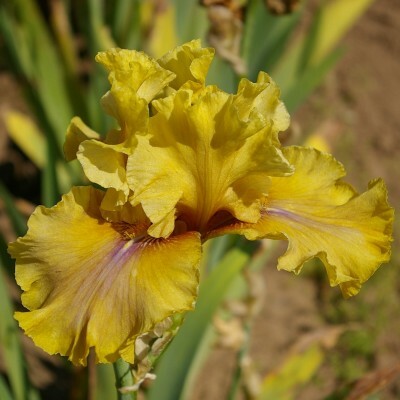 The flowers are average-sized, compact and well-proportioned in relation to the plant. The beards are mandarin-toned and the stem carries an average of 7 buds. 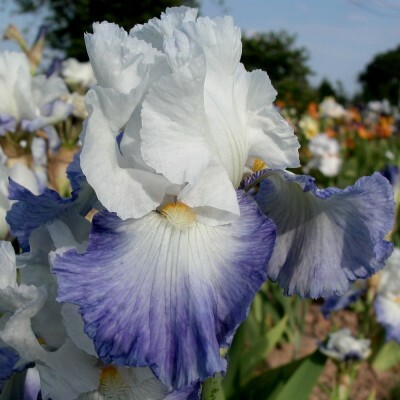 Pure white standards and white falls with a wide pure mid-blue border. Pale yellow beards. 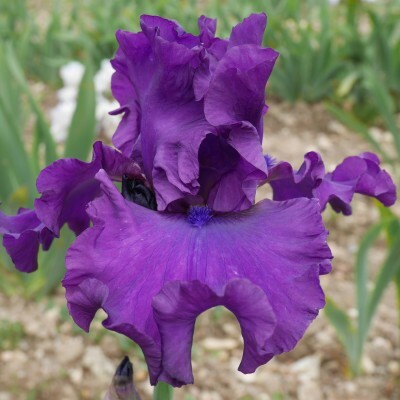 Excellent grower and bloomer. "Alizes" gained the RHS Award of Garden Merit in 2000. 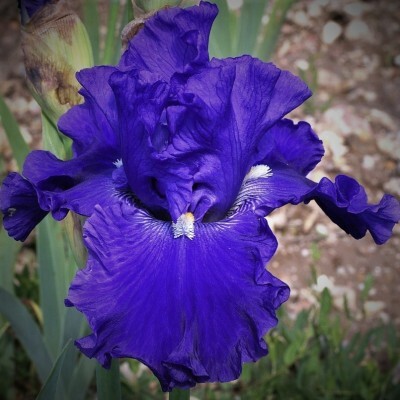 This descendant of 'Above The Clouds' is definitely one of the best intense medium blue irises, if not the best , because it is so truly blue! 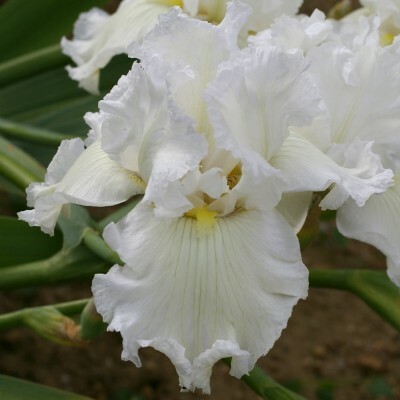 Its imposing flowers (falls are 12cm wide) in good proportion with the tall sta lks, are firm and strongly ruffled. An elegant descendant of the excellent "Crowned Heads". 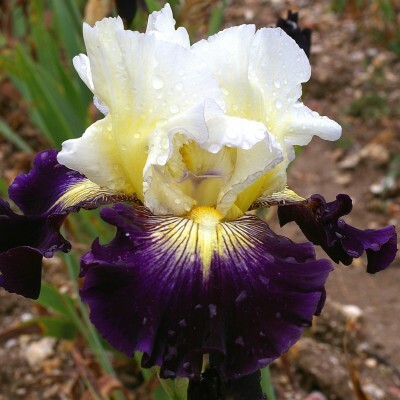 Light blue standards and snow white falls with just a touch of greenish yellow near the sunshine yellow beards. Particularly attractive flowers with little ruffling. Vigorous growth. Perfectly plain raspberry or rosy mulberry, beards the same. 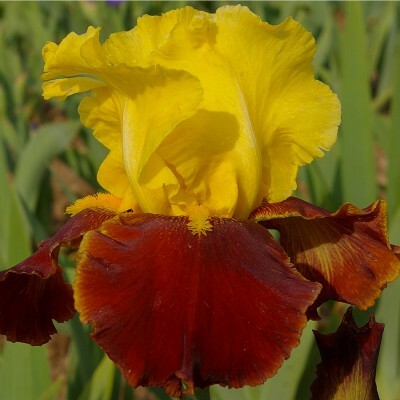 Excellent new colour and interesting variety for hybridizers who would like to create a true red iris. RHS Award of Garden Merit 2006. 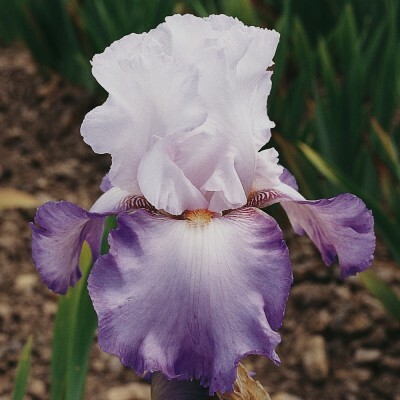 Very pale pink standards and medium purple-pink falls with a pinkish white border. 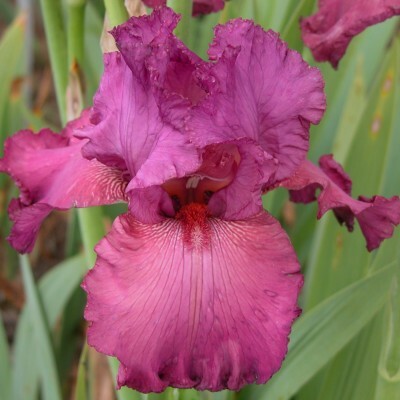 Amazing rust-red beards bring great flair to this remarkable two-toned iris. 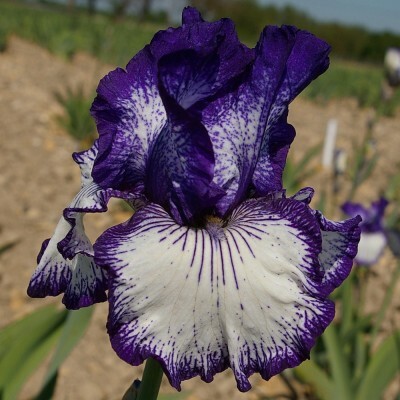 Excellent variety with dark violet standards marked with white in the centre and pure white falls with a clearly drawn dark blue-violet bordure 1cm wide. Very floriferous with 8 to 12 buds. 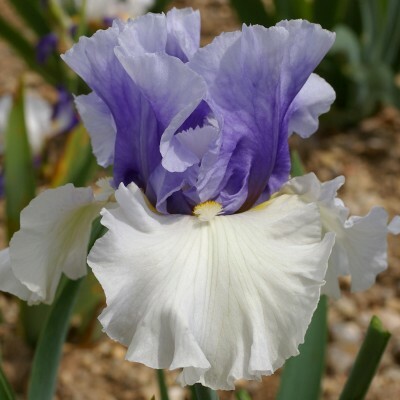 Pure white standards, pale lilac falls, deeper towards edges. Discreet orange beard. "Astrid C." gives a strong feeling of freshness. 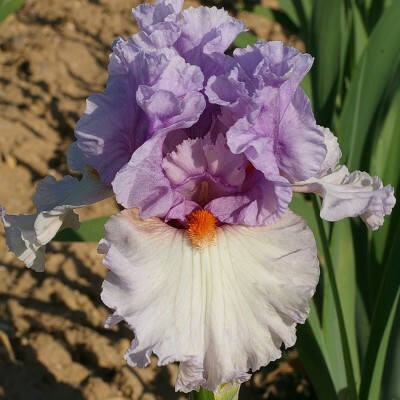 Gorgeous heir of 'Above The Clouds' with large copiously ruffled flowers and simply elegant. 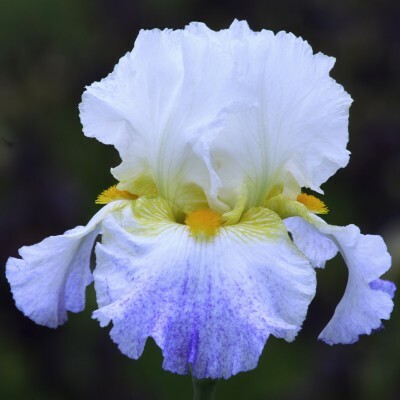 Sky blue with discrete pale yellow beards. Shafts are superb with 3 stalks and 8 to 9 buds on average. Extremely tall but sturdy and wind resistant. Pale copper standards, darker towards the edges. Light Amethyst-coloured falls with a fine (2mm) reddish copper brim. Dark copper beards. Wide branching. Late flowering. 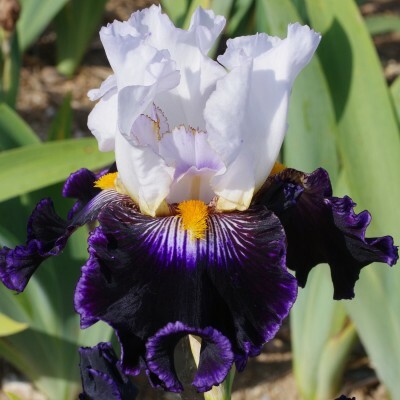 Creamy white standards infused with lime yellow at their base ; violet-black falls featuring a small creamy centre and white beards with yellow tips. A very charismatic variety which we are delighted to name after the lovely town of Aubigny-sur-Nère where Scotland is yearly celebrated with pride. The cross "Chevalier de Malte" with "Conjuration" has given us many good seedlings, "Aurélie" is one of them. 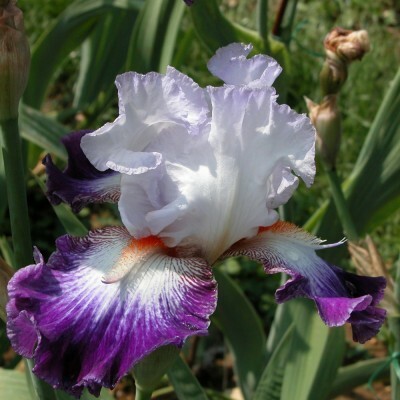 It has white standards with lavender on their edges and flaring purple-violet falls with a large white centre. The thick red beard ends in a white spur. Well-branched stalks. Winner at the Florence iris competition in 2007. 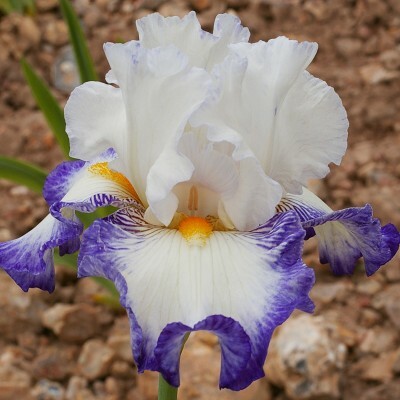 This historic variety (a descendent of "Dalmatica") features light to mid tones of lavender, lighter around the white, golden-tipped beards. 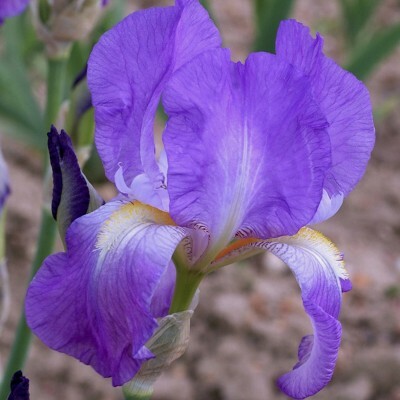 Flowers are larger than the Iris Pallida's, and quite charming. Bright clean white standards and wide pansy violet falls. 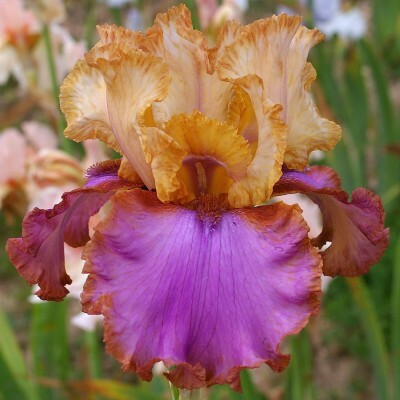 White heart streaked violet and lit up with a liminous orange-red beard. Excellent stems. Sixth prize at the American Convention in 1998. One of our best creations. 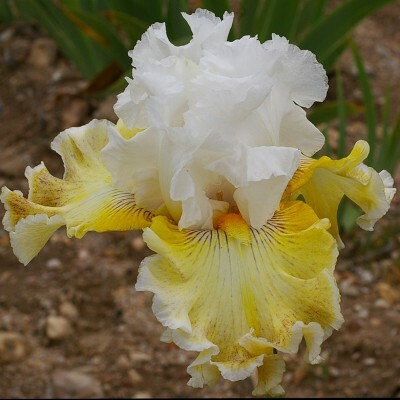 New and strange: absinthe yellow to buff yellow standards; almost horizontal falls, absinthe to amber yellow with a hint of light violet below the bronze yellow beards. Prolific plants producing numerous tall stalks with many buds. Strong ruffling. Faïence de Gien's excellent seedling brother is very elegant but taller. 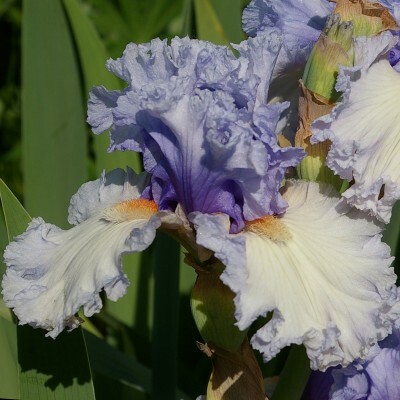 Its exceptional lower branching stalks carry 7 to 8 buds. 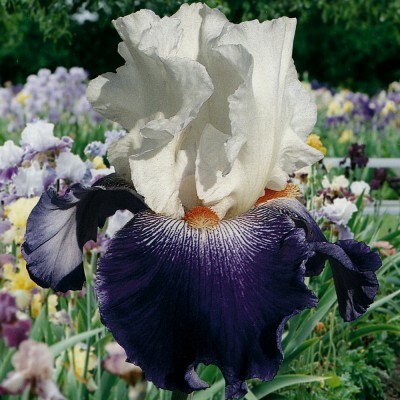 It features milk-white standards whilst the very wide white falls have lovely violet and purplish black borders (over 2 cm) and are veined with fine lines of the same colour which run parallel to the golden yellow beards. 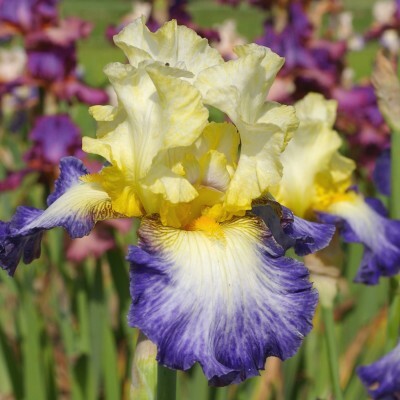 Soft lemon yellow standards, more intense at their base, white to cream falls with a wide deep violet-blue border, spreading towards the centre. 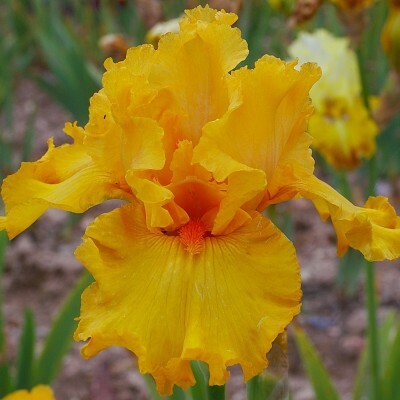 Pale orange beards edged with yellow. 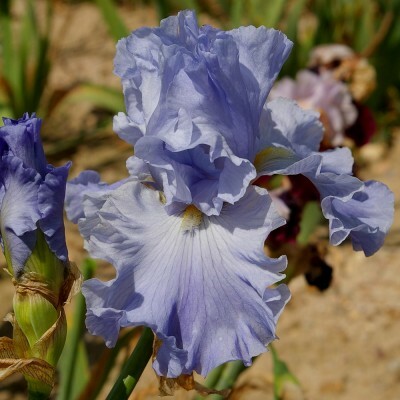 The numerous flowers (up to 11) are enlivened by regularly-spaced waved edges and the stalks are perfectly branched. One of the best, if not the best, of this combination of colours. 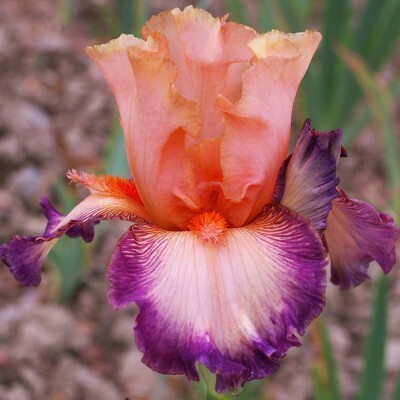 Soft lavender standards and white falls tinted very pale pinkish lavender, contrasted against the bright tangerine beards. 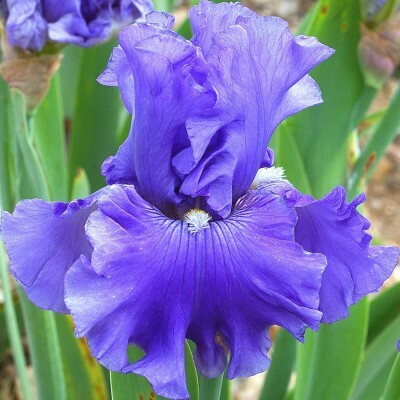 An iris with lots of finesse and great style! Very ruffled flowers, 8 to 9 buds per stem. Vigorous grower with good resistance to disease. 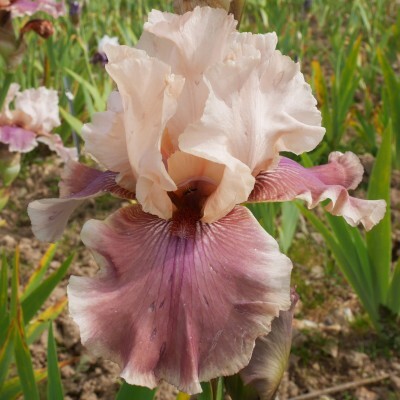 Wonderfully lively and salmon-pink standards framed by creamy pink, nearly horizontal falls with amethyst borders (over 5 to 7 mm). Long and thick coral-red beards ending in spurs of the same colour but which light up the pink of the falls. These truly inimitable lively tones will please those who are looking for a touch of brightness. 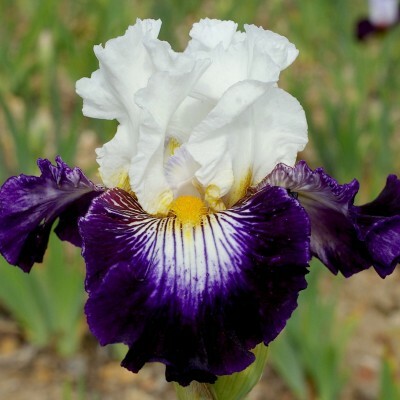 Broad flowers showing a lovely contrast: pale blue standards on wide and velvety pansy violet-blue falls, lighter on edges. Small tangerine beard with a white end. Good grower. 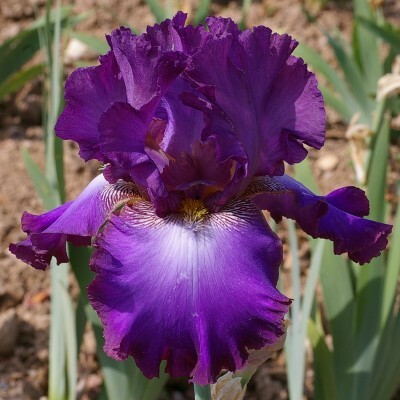 Beautiful two-tones violet with pur violet standards and purplish violet falls almost black on the edges and around the bronze beards. The wide falls have a velvety lustre and waved edges. Straw-yellow amoena which is lighter around the butter- yellow beards. The falls feature graceful frills and a thin white border (1 to 2 mm) and the edges are speckled with brown-red. An exquisite shape. Pleasant contrast between the clear yellow standards and the light blue-mauve falls. Long flowering. The very last one to flower! 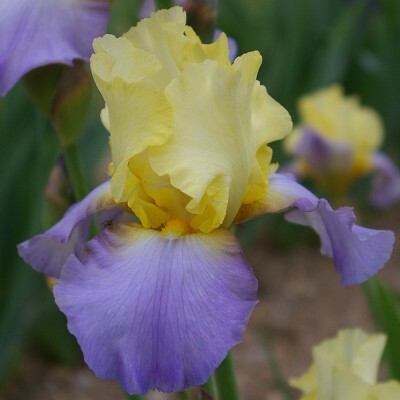 Pure light yellow standards and white falls with a wide, dark blue-violet brim. 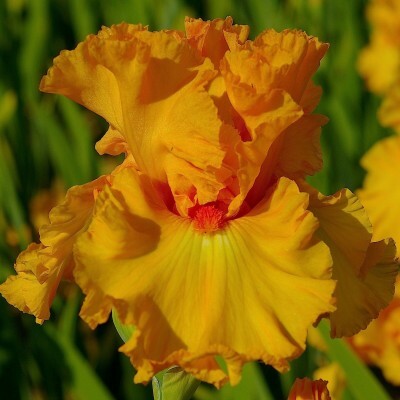 Orange beards sometimes lengthened by a violet spoon and surrounded with yellow markings. Very strong substance. Well-branched stalks carrying 8 buds.